Boise Daily Photo: Cinderella Visits Boise? This is always a bit disturbing to me, one shoe at the side of the road. I see it fairly often, although, not usually with a sock inside. 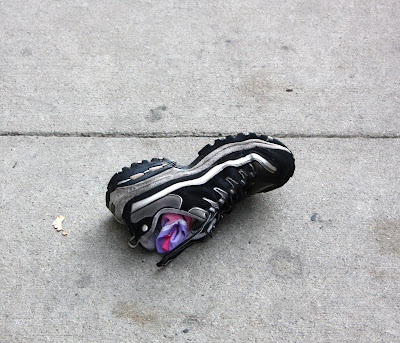 If this is your shoe, you can find it along Capitol Boulevard across from the Grove Hotel. Me too. I know someone went home barefoot! LOL, explain that to your Mom. This must be a universal thing...these shoes along the side of the road or sidewalks. Sometimes a pair of shoes...sometimes a lone shoe. I've always wondered why? Looks like a Skecher in pretty good shape, too. Very weird. If you find that disturbing D. you won't want to hear about the 5 separate sneakers found along the BC coast with feet inside them. All in less than a year.